Dark Eradicator Warlock and Mythical Beast Cerberus appear in this card's artwork. This card, along with Mythical Beast Cerberus, are the first Structure Deck Exclusive cards to be in two different Structure Decks. 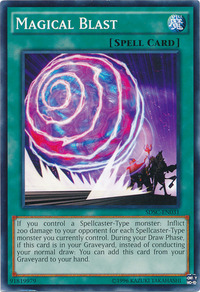 This card and Divine Sword - Phoenix Blade were the first two ever Spell/Trap cards to ever have effects in the Graveyard. 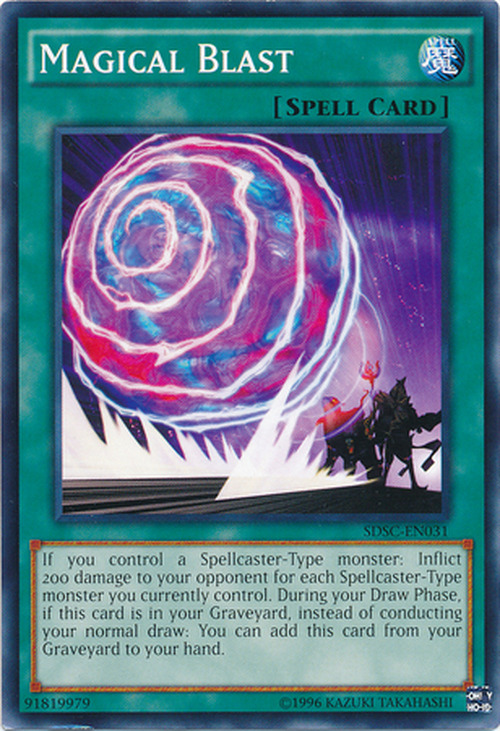 The number of Spellcaster-Type monsters is counted when "Magical Blast" resolves. If your opponent chains an effect to "Magical Blast" that destroys all of your Spellcasters, it still resolves but will do 0 damage. The effect of "Magical Blast" that activates in the Draw Phase can be chained to. If you have more than 1 "Magical Blast" in your Graveyard during your Draw Phase, you can activate them both, but only 1 will resolve. The other will remain in Graveyard. This forms a chain because they are activating simultaneously (at the specific point in time that you would otherwise draw). If you also have "Freed the Matchless General" on the field, you can only resolve either his effect or "Magical Blast's" effect, but not both. If you can not draw a card, either because you have no cards in your Deckof because of a card effect, then you cannot activate the effect of "Magical Blast". Note that the effect of "Hino-Kagu-Tsuchi" resolves before the Draw Phase, so you could activate the effect of "Magical Blast" after his effect resolves.